“Radical” Russ Belville has been advocating for the end of marijuana prohibition for over a decade. He is a proud Oregon transplant, as so many of us are, and is instrumental in informing everyone about cannabis in this nation through his internet radio show The Russ Belville Show. We are glad to have him contributing to the Oregon Cannabis Connection and wanted to give everyone a bit more insight into his motivation, inspiration, and plans for the future. Luckily for me, Russ was able to sit down and chat with me during the Thanksgiving weekend, and this is our conversation. OCC: When did you become involved in the marijuana legalization movement? RB: It was kind of late, actually. It wasn’t until May 2005 that I officially got involved. I grew up in Nampa, Idaho, and didn’t smoke pot until I was 22, and I never took it as any sort of political thing. I just smoked pot, I knew it was illegal, and I knew that was stupid, but I didn’t do anything about it. I got married in 2001 and moved to Oregon in 2003 because my wife, Iva Cunningham, needed to be a medical marijuana patient. That’s when I started to become political, because in Oregon everyone is more political, about anything, really. There were events happening with Oregon NORML, the Seattle Hempfest, and other activities, but it was May 7, 2005, that I went to the Global Cannabis March at Portland’s Pioneer Courthouse Square. I was blogging at the time and a woman named Anna Diaz came up to me… and she had been reading my political blog. She was excited to meet me at the march, and she introduced me to Madeline Martinez, who was the Oregon NORML Executive Director at the time. From that moment on it was just a whirlwind of activity getting me involved. Just two weeks in I was hosting their Oregon NORML cable access TV show, and a month in, I was redesigning their website, and within six months I was the Associate Director. Russ on the Cover of OCC’s Dec/Jan issue! Image: Allan Erickson. OCC: You eventually became involved with the national NORML organization, how did that come about? RB: It was a remarkable case of being at the right place at the right time and having a whole lot of luck. In 2006, with encouragement from my wife Iva, I entered a nationwide talent contest through a liberal talk radio station, KPOJ in Portland called “The Search for the Next Progressive Talk Radio Star.” I knew nothing about talk radio, but after weeks of pestering from Iva to enter the competition, I hurriedly put together a two minute clip the night before the deadline… it was something about Bill O’Reilly and how stupid the idea of a “War on Christmas” was. Well, to my surprise, I won the local competition, and eventually made it to the finals out of 24 entries. The final head-to-head competition was held at the Center for American Progress, a liberal think tank in Washington D.C. before a live crowd of about 300 people. I won that event, too, beating a gentleman from Colorado! That led to a talk radio show on XM satellite radio I did for two years, until it was dropped after the merger of XM and Sirius and the subsequent downsizing of shows that occurred. In the meantime, Chris Goldstein had created the Daily Audio Stash internet podcast for NORML and coincidentally had to leave as the host of the program just when I got the ax from XM radio. NORML put out the call, “Is there anyone out there that knows a lot about marijuana who also has radio experience?” It was the perfect job for me, so I started working for national NORML doing the Daily Audio Stash. That’s when I learned that a podcast takes more work than a live show. If you want to do a 30-minute podcast it can take four or five hours of work, because of editing, re-recording, and fixing and all that. But, if you do a live show, it takes as long as a live show, so I transitioned the Daily Audio Stash into NORML Show Live—A live podcast recording. Then, I thought it would be great if other NORML chapters had that and could be on the same network, so I created the NORML Network that provided a live 24-hour stream of activist content. I was also the National Outreach Coordinator for NORML, and was basically responsible for recruiting new chapters and coordinating existing ones. In my four-year tenure, we created 71 new NORML chapters. OCC: When did you start The Russ Belville Show? RB: I left NORML in May 2012 and started 420 Radio and The Russ Belville Show independently in June. I went through a few changes early on, including the name “Pot Net”, but eventually decided on 420 Radio, partly because I could get it. 420Radio.com was taken, but 420Radio.org was not. The whole reason for having 420 Radio was to continue that mission of giving activists around the country and around the world a place for their messages to be heard. There’s a lot of great podcasts out there, but unless you’re looking for them, you don’t know they exist. I figured if you have a live stream and you turn it on every once in a while, you would hear something playing and you might think “Who’s that; that’s an interesting topic” and that would lead you to subscribe to their podcast. I was always way too busy to develop it properly, to market and advertise it, so now what’s come up is that a group of people who already put together a podcasting network for the video gaming industry now want to put together a podcasting network for cannabis. It’s called CannabisRadio.com and they have signed me on. My show, The Russ Belville Show, is exclusively through CannabisRadio.com. 420 Radio is going to become an all cannabis-related music stream, and also provide entertainment-related programming like cannabis cups, hempfests, expos and stuff like that. The current talk radio shows will migrate over to CannabisRadio.com. The CannabisRadio.com lineup will include live talk radio, live event coverage and election coverage, and podcasting for all cannabis subjects. We cover legislation, advocacy, cultivation, legal issues, enthusiasts… all sorts of categories. For example, Vivian McPeak of Seattle Hempfest has a show, Mitch Earlywine of NORML has a show, SSDP has a show, and Kyle Kushman, the renowned grower, too. We’re building a one-stop shop for all the best cannabis-related shows. OCC: You supported Measure 91 in Oregon, can you explain more about what you did during the campaign? RB: Over the years I have had many opportunities to deal with those opposed to cannabis legalization. Currently, the opposition is led by a guy named Kevin Sabet. His group is called Project SAM, or Smart Approaches to Marijuana use, but I like to call them Project SAMUEL, Smart Approaches to Marijuana Uses Except Legalization! They are the leading anti-marijuana group and I had the opportunity to debate him at the Baker Institute in March of 2012. I have seen him in a lot of debates and I’m proud to say I think I flustered him more than anyone I have ever seen. Kevin Sabet is the Joker to my Batman. All your best superheroes are defined by their enemies, and he is my Joker. Back in 2012, during the failed Measure 80 campaign in Oregon, Sabet came out here on the taxpayers’ dime, where local drug treatment and drug prevention type organizations used grant money to pay for him to spew his reefer madness all around the state. Well, in 2014 he announced the same damn play, except this time Measure 91 had more support and the backers objected, citing Oregon’s strict campaign laws against politicking with public money. After I started writing about it in my Blog, it got picked up on by Representative Blumenauer’s office (who is my Congressman and I’m proud to say I get to vote for him). His inquiries into the misappropriated funds made such a scare that many counties backed out. 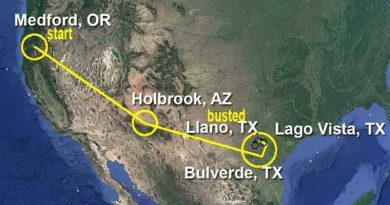 Of the 13 tour stops Sabet had planned, he had to cancel six. Once the evens stops were determined, I researched the funding of them using Oregon’s open records law, which is our Freedom of Information law here. The email records I obtained showed a lot of shenanigans were happening, which included using county resources and county time to solicit private funds to pay for Sabet’s tour. They also showed he was paid $3,000 dollars per stop, plus expenses, so I’m happy to say I cost Kevin Sabet $18,000 dollars, but he still made $21,000 for going to these other seven places, plus expenses! To top it off, once Sabet got here, I used a Go Fund Me campaign to rent a car and follow him all around the state and attend each event so I could ask questions, take pictures, and document the whole thing. I definitely caused him a lot of consternation during the presentations. 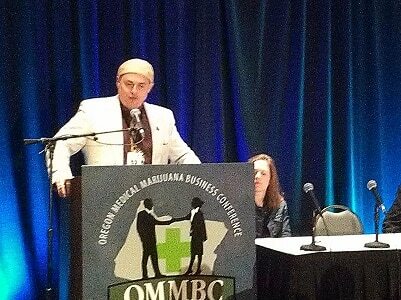 OCC: You helped with the creation of Portland NORML, how did that come about? RB: We formed in January 2015 and it came about because my friend Randy Quast, who founded Minnesota NORML back in Minneapolis, moved to Portland and he wanted to get involved with NORML out here. He didn’t see a lot happening with Oregon NORML or other chapters so he asked me if I would be interested in co-founding a chapter of NORML for Portland, and I thought that was a great idea. Now that we’re legal, we need to come up with how we can be equal, so there’s a lot of work left to do. We have been involved with a couple of the hemp expos, we’ve been having two or three meetings a month that are at the Analog Cafe. We are helping people get their first seedlings and marijuana seeds and educating them on what’s happening in the city of Portland concerning commercial regulations, zoning issues, and all the rules pertaining to recreational marijuana here in Portland. OCC: You received a little heat from activists in Ohio recently: what happened there? RB: I have done marijuana election night coverage every election since 2010. I covered Prop 19 in California from Oaksterdam. In 2012, I was in Seattle and had live correspondents in Portland and Denver, and in 2014 I was here in Portland doing coverage for Measure 9. In 2015, some activists got donations together to fly me out to Columbus at the last minute, literally a month before the election, and I covered their election for Issue 3 of the OCC. The proposed legislation was incredibly controversial, especially among the activist community. First, it mandated that there would be only 10 “lands” upon which commercial cannabis could be grown, and those 10 lands were already owned by the 10 investment groups that kicked in 10 million bucks each to get the issue on the ballot. To many that smacked of an oligopoly of big money being able to buy themselves the capture of the wholesale marijuana market. It was very, very unpopular amongst the activist community. To add insult to injury, they went and used this cartoonish mascot called “Buddie” to try and promote it amongst the college kids, which played into the worst fears of our opponents, when they say, “big marijuana is going to be the next Joe Camel.” And there they go, they go and make “Buddie” the next Joe Camel. It was very unpopular and most in activism community were dead-set against it. I was one of the few national voices that was very triumphantly cheering for it. Colleagues couldn’t believe that I would be standing up for this, even activists I’ve known for 10 years, but for me it’s really simple: I’ve been dealing with a monopoly my whole life… “the guy.” When you’re a weed smoker, you gotta have “a guy.” You have to know a black market connection, and usually it’s “a” black market connection. Most people don’t have more than one, and if you do, it’s two or three, almost never immediate access. I don’t care who’s growing it, I never have cared who’s growing it… I’m from Idaho where we have two kinds of strains, Got Some and Don’t! So, for me I don’t care who’s growing it. I have four requirements, basically in this order: can I possess it, can I use it, can I grow it, can I but it. It fulfilled all those requirements for me. For 10 years I’ve been counseled on how the war on drugs is, as Michelle Alexander put it, “the new Jim Crow” or as Judge Jim Gray said,“the worst policy decision since slavery.” To say we’re not going to end that because we don’t like the way the business end is set up, means we don’t really think it’s as bad as slavery or Jim Crow. That’s where I came down on it. If it ends arrests and ends harassment, the rest of the details on the back end can be worked out. OCC: What are your plans for 2016 with The Russ Belville Show and CannabisRadio.com? RB: I’m an old road musician. I started smoking weed in 1990 mostly when I was playing rock music in bars. I was born on the road… my dad’s an old musician and I literally grew up on the road in a base drum case as my play pen. When I became a young man I toured and loved playing on the road. I always wanted to marry that part of myself, the “rambling man,” with the marijuana advocacy and do a tour. We would show up in places like Wichita, Kansas, and Enid. Oklahoma, and Fargo, North Dakota, and Richmond, Virginia and all across the country! We can do 90-minute presentations explaining why they should embrace cannabis, or everything you ever wanted to know about marijuana, or something else, and broadcast the Russ Belville show from those locations, too! 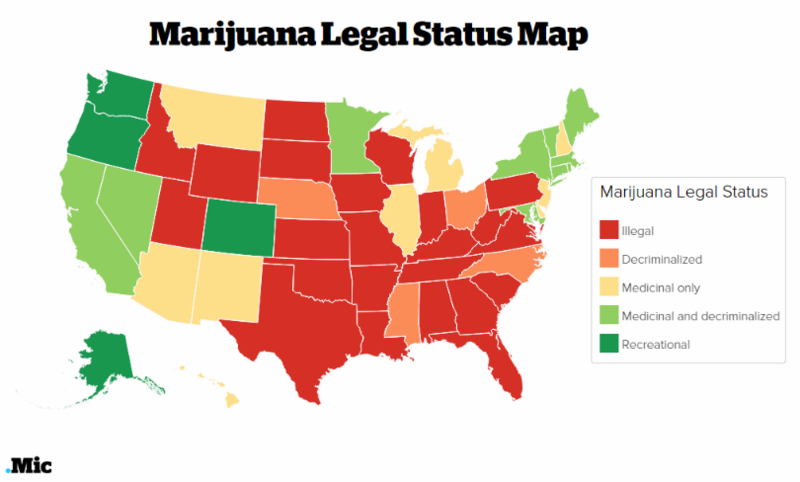 They don’t know this stuff in Oklahoma, they don’t know this in West Virginia, so I want to go to these areas and sort of “seed” the intellectual and political ground to get people to start thinking about legalization as it’s coming around their way. My dream may become a reality with CannabisRadio.com. They have a fifth wheel available, so we just need to get a pick-up, a wrap, some sponsors, and the schedule. We will take it to college campuses perhaps. We will hopefully have an exhibit—a hemp and cannabis museum of sorts for people to see so we can show people a block of “hempcrete” and hemp rope and clothing. We are looking for sponsors! We are in the early stages, but we will have room for big sponsors and smaller donors as well, and can recognize them on the RV or on the show. Anyone interested should let us know soon, we hope to be in San Bernadino covering the High Times Cannabis Cup January 30 and 31—a huge two day event! To contact Russ Belville, you can simply email him at radicalruss@gmail.com. Find him @RadicalRuss on almost every social media – Gmail, Facebook, Twitter, Instagram, YouTube, SoundCloud, LinkedIn, Snapchat, Periscope, and Ustream.